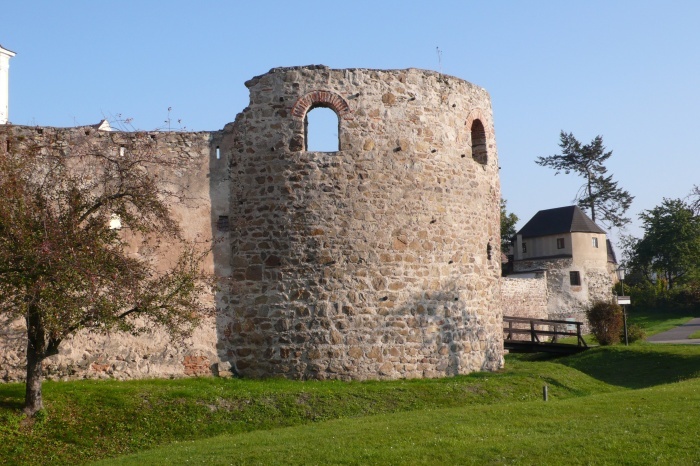 The most prominent, well preserved features of the Roman fort in Mautern-Favianis are two high raising towers incorporated in the medieval curtain wall (U-shaped tower, fan-shaped tower). The fort, which controlled a Danube crossing on the eastern end of the Wachau valley lies below the medieval town center and is well investigated. A cultural trail, which begins at the parking lot in front of the Römerhalle, guides visitors through the city’s history. The fort at Mautern, built by specialized military craftsmen from the Roman army at a slightly higher terrain above the river bank to avoid flooding, observes and controls the eastern end of the Wachau valley, where it opens up into the wide fertile plain of the Tullnerfeld. Apart from the marvelously preserved western fortification wall, which is well illuminated by night, the whole fort area is covered by the center of the small atmospheric town. Visitors are offered a historic trail leading to the important local highlights including the Roman monuments and the museum and a wide range of eating places, from first rate restaurant to several local guesthouses, wine taverns and a famous pastry shop. The Roman museum presents a good collection of local artefacts with a stunning, colorful wall painting rescued during excavations from a Roman well south of the fort area. The garrisons of the first three centuries AD, mainly infantry soldiers who rebuilt and maintained the timber and later stone structures of the fortification, were replaced during the 4th century by 1000 heavily armed men of the Legio I Noricorum, a late antique elite troop emphasizing the importance of the stronghold in Mautern. They turned Mautern into a strongly fortified place with thick walls fan-shaped corner and U-shaped intermediate towers – two of them are still visible along the western wall. At a certain point they even enlarged the fortified area towards the Danube to better protect the access to the river and the local inhabitants in times of crisis. During the course of the later 4th century AD the force level of the Roman army underwent massive and constant reductions due to the lack of men power and money. The living conditions for soldiers, monks and civilians in Mautern and in other forts in Noricum, vividly described in the Vita Sancti Serverini, were dominated by outside threats, lack of supply and hunger crisis before the frontier was finally given up in 487/88 AD.